So declared incumbent Colorado governor, John Hickenlooper, in a recent re-election campaign debate. Many states have relaxed marijuana laws, such as for medical use or by decriminalization, and two states, Colorado and Washington, have legalized its recreational use. 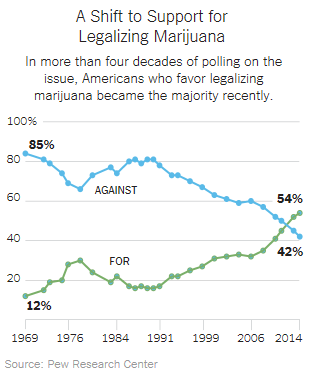 Furthermore, public opinion at the national level is gradually swinging over in support of legalization (see below). The New York Times published five lengthy editorials on this subject last summer under the heading of “High Time,” taking the position that the health risks of marijuana use are minimal (except for adolescents) and that it should be left up to the states to decide on the issue of legalization. Driving while cannabis intoxicated doubles the risk of an accident; this risk substantially increases if users are also alcohol-intoxicated. Cannabis use during pregnancy slightly reduces birth weight. 1 in 10 cannabis users develop a dependence syndrome; 1 in 6 for adolescents. Regular cannabis users double the risk of experiencing psychotic disorders. Regular adolescent cannabis users have lower educational attainment. Regular adolescent cannabis users are more likely to use other illicit drugs. Cannabis smoking in middle age increases the risk of myocardial infarction. These adverse effects of marijuana use are serious. My own opinion is that Colorado and Washington probably made a mistake by legalizing the recreational use of marijuana. At any rate, an experiment is now being conducted in these two states and in a few years we will know how it works out. Other states should be reluctant to follow suit until then. In the meantime, I support national legislation to decriminalize marijuana use but not to legalize it. Drug use and misuse has huge economic ramifications and so it is very important to have a sensible and rational national policy on this issue. This entry was posted in Addiction, High Time, Jack Heidel, John Hickenlooper, marijuana decriminalization, marijuana legalization, New York Times, Wayne Hall and tagged Colorado was reckless, jack heidel, marijuana decriminalization, marijuana legalization, New York Times by jackheidel. Bookmark the permalink. You write “Drug use and misuse has huge economic ramifications and so it is very important to have a sensible and rational national policy on this issue”. Alcohol use and misuse also has huge economic ramifications and there is no national policy on this issue. The 21st Amendment repealed national prohibition but everything else is left up to individual States. (except minimum legal drinking age 21). Colorado and Washington both have the legal age at 21. Regular alcohol use among adolescents has all the same effects as cannabis. That’s why it is illegal for underage users, whether they choose alcohol or cannabis. The 18th Amendment was repealed. Neither is the War on Drugs. We tried Prohibition for alcohol and it didn’t work, as even John D. Rockefeller recognized. We’re now essentially trying to prohibit all mind-altering drugs and I’d say that’s it’s better than the alternative of legalizing them. As I did say in the post, I am in favor of decriminalization (of marijuana only) where possession is a civil offense, with a fine, rather than a criminal offense with possible incarceration. At any rate, thanks to Colorado and Washington, we’re now conducting a national experiment on the desirability of legalization of marijuana. If other states vote to go the same way, there’s nothing to stop them. I predict a bad outcome to this experiment but time will tell and, of course, I could be wrong. In the meantime I think it would be sheer folly, reckless as Colorado Governor John Hickenlooper would say, to legalize marijuana on a national level.